If you like beating up baddies and looking super stylish doing it, Super Crush KO might be for you. 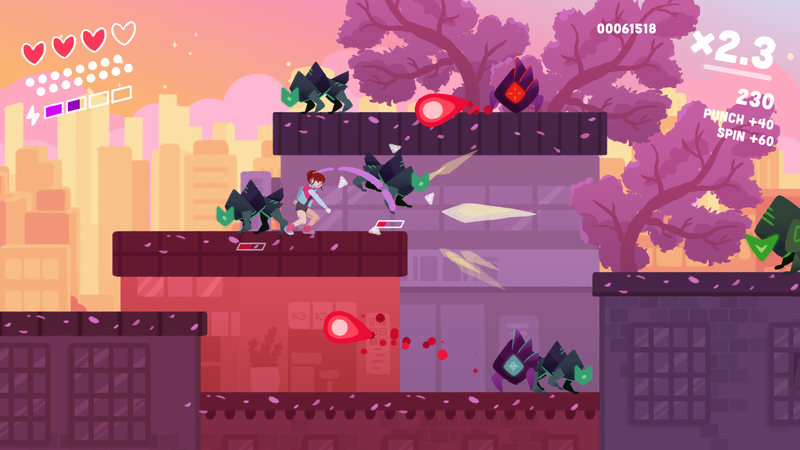 Developed by Vertex Pop, creators of the similarly stylish Graceful Explosion Machine, Super Crush KO is an arena brawler who’s characters and movement are fast and fluid, while also looking really cool. If you have played Graceful Explosion Machine, (if you haven’t you should!) Super Crush KO might look familiar. Players are put into an arena and must deal with the enemies that appear before they can move on. The standard moveset includes a melee and ranged attack as well as a dodge. Finding different items, like a soft pretzel, adds an additional move to that repertoire. Vertex Pop compared this additional move to a smash attack from the Super Smash Bros series. This attack will do different things depending on which direction players point the control stick, as well as if they are on the ground or in the air. In the Pax East demo, activating it on the ground did a forward lunge that could move through enemies, but aiming it upwards would do an uppercut throwing the player and the target enemies into the air. Something else Super Crush KO has in common with Smash Bros is its platform usage. Platforms are used to create different levels of elevation and different options in engaging with enemies. Players won’t be asked to do difficult platforming sections or to combo attacks on enemies to get across a deadly pit. Combining all of the available moveset options to engage the enemies in a fast and fluid manner is really what Super Crush KO is all about. Each combat scenario gives players a style rating, judging them based on how well they can chain attacks between enemies and keep from taking any damage themselves. Combat isn’t the only stylish part of the game though. The game features a vibrant pastel color scheme and even the enemies get in on the action. Vertex Pop saw how many beat-em-up style games feature a dark aesthetic, and they figured why not make something colorful. The music is also vibrant and poppy, fitting well with the frenetic action taking place on screen. Super Crush KO is looking stunning, and interested fans hopefully won’t have to wait too long to get their hands on it. It is expected to launch in 2019 on the Nintendo Switch and Steam.